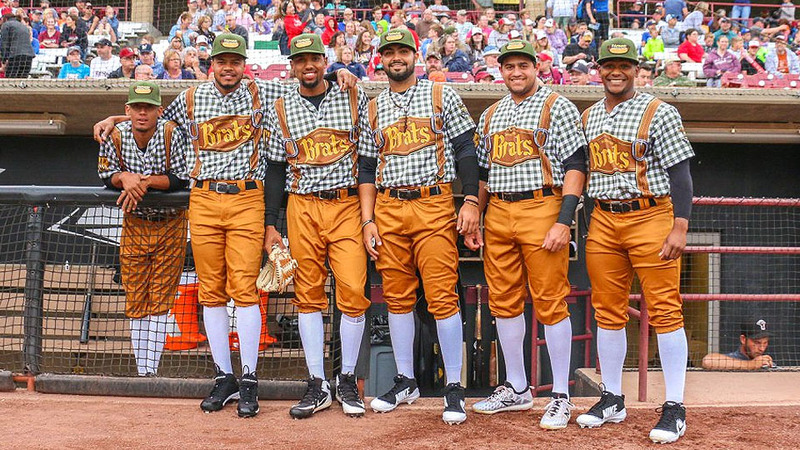 The Wisconsin Timber Rattlers, Class A affiliate of the Milwaukee Brewers, suited up as the Wisconsin Brats for "Bratoberfest" on Saturday. This celebration of sausage, German heritage and the intersection thereof was highlighted by what may have been the most eye-catching theme night uniforms of the 2018 season. Players took the field wearing a Bavarian-inspired ensemble of high socks, lederhosen, suspenders and plenty of plaid. This look was topped off by caps featuring an image of a well-grilled brat nestled in a bun and dressed with sauerkraut and an artful squiggle of mustard. Finally, an alternate logo featured an anthropomorphic brat in full Oktoberfest regalia, happily toting two smaller brats. The visiting Cedar Rapids Kernels, unlike the Ramones, did not beat on the Brats with their baseball bats. Wisconsin cruised to a 4-0 victory and is therefore undefeated while wearing lederhosen. The temporary adoption of regional food-based identities has been one of the hottest Minor League Baseball promotional trends of the past three seasons. Timber Rattlers president Rob Zerjav thought it was only natural that his team would get in on the act. "Seeing other teams doing it, we thought, 'Maybe we'll do that.' That was probably the easiest part of the whole thing," he said. "In Wisconsin, it's got to be a brat, so we jumped on that right away. Our [front office] creative group started doing searches online. The lederhosen idea came up and it spiraled from there." Timber Rattlers creative director Ann Mollica devised a template for the uniforms, which was sent to design firm Brandiose. The Timber Rattlers were already familiar with Brandiose, which created the logos for their sister team, the summer collegiate Fond Du Lac Dock Spiders. Zerjav reported that over the past several weeks, the Timber Rattlers shipped Brats merchandise to 38 states. "When the players got the jerseys to try them on, initially [the reaction] was, 'Seriously?'" Zerjav said. "But once they put them on and found that the pants were comfortable, they started getting into it. And once social media [reaction] blew up, they got excited about it. Fans, local media, everyone thought it was great." As for the Saturday evening game itself, the tone was set by a polka band performing just outside of the Timber Rattlers' Fox Cities Stadium. Meanwhile, the video board played plenty of clips featuring yodeling, lederhosen and the combination of the two. And then there were the brats themselves. The Timber Rattlers didn't need to adjust their concession menu for the evening, as they already sell a variety of Cher-Make brats (original, chicken, zesty, Polish and cheddar) on a nightly basis. Cher-Make is headquartered in Manitowoc, Wisconsin, approximately 45 miles east of the Appleton-based Timber Rattlers. Bratoberfest occurred just two nights after the Timber Rattlers' annual "Salute to Cows" night, which celebrates Wisconsin's dairy industry. Could Bratoberfest be on its way to being a yearly staple of the team's promotional calendar? "We haven't talked about it yet," said Zerjav. "But it was very successful, so there could be some kind of reincarnation." In Charlotte, the Knights once again took the field as the "Pitmasters." The result was an evening-long celebration of local barbecue. And last but not least, the Omaha Storm Chasers paid tribute to the Nebraska meat pie delicacy that is the runza. Their opponent was the Albuquerque Isotopes, who obliged the evening's local food theme by suiting up as their "Green Chile Cheeseburgers" alter-ego.